Awoke this morning the the sound of gentle rain amongst the leaves. It was very calming and a great start to the first day of Paul Sellers 9 Day Foundations class. Classes are held at the Maplewood Center for Common Craft located between Schuylerville and Greenwich, NY which is a beautiful part of the country. The first step is to prove that I am actually at the school, so here is a photo of Paul, who’s bench is right behind me. We spent some time breaking the ice, talking philosophy and seeking common ground, after all spending 9 days with a group of 18 people that you have never met will take effort. Then Paul got to work. Introducing sharpening, tools and techniques. If you have ever watched his videos, read his blog, participated in his masterclasses or seen him on Facebook he is absolutely genuine. He practices what he teaches and his good humor, experience and total passion for woodworking was present throughout the day. I’ll take more pictures of the workshop over the week but it is a beautiful timber framed building with great light and a nice open feeling. 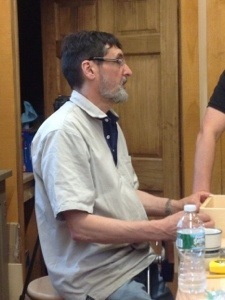 The class grabs stools and huddles around Paul’s work bench listening, taking notes and asking questions. He explains, demonstrates and then sends us back to our own benches to practice the lesson. The basic tools that we have for the first day were set out neatly at each bench. As you can see there is a total of fourteen including a pencil. 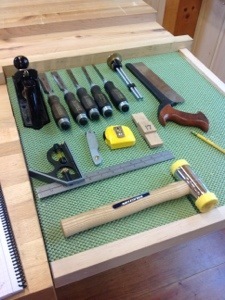 These are the same or similar to the tools Paul uses in his blog and the online Woodworking masterclass series. I noted some more tools in a box stored under the bench, which I am sure will be used later in the class. The tools are incredibly sharp and ready for use. Tomorrow I will take a picture of the bench which is the same design as Paul describes in his blog with a quick adjustment vice. 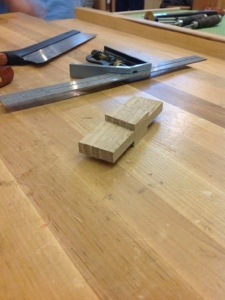 Lesson one began with making a dovetail, yes the joint that makes woodworkers tremble in fear. Paul’s simple instruction and process was concise and when put into practice produced some very nice results. This was not my first time cutting this joint, but it was the first time I began to really understand how to effectively cut it. I struggled with the saw initially, but made my way through the joint. Paul next took time working with the class on sawing technique, in particular only using the weight of the saw to make the cut. After watching, and listening (a critical part of understanding the performance of the tool) we made many test cuts. Brilliant, this was one of those moments that I came to the class to grasp. Once I truly unloaded the saw, it was poetry in motion. The second item that Paul passed on concerned correcting a mis-aligned saw cut. If the saw begins to wander from the line it does not help to apply pressure to the saw plate to force it back to the line, this in fact makes the mis-alignment worse because the curve of the plate against the side of the cut forces the teeth in the opposite direction. Instead lift the saw up to the point where the problem began and use the teeth to cut down your planned line. It seemed obvious when he explained it to the class, but it was another piece of information to tuck away. After spending time listening to Paul’s teachings around his bench and watching his demonstration we began the first of three projects (many of these are shown in Paul’s book) a dovetailed box. The class worked along and with the wonderful sounds of saws and chisels we spent a relaxing and informative afternoon. In fact I entered “the zone” my eyes were focused, my ears tuned into the sound of the saw and chisel and and my focus was purely on working with wood. How long I worked like that I am unsure, but when I looked up complete with the lesson I was a little ahead of others. 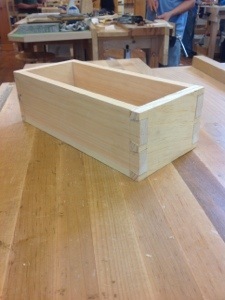 This gave me the opportunity to do a little extra project and make my own dovetail guide with a little help from Paul. It’s simple and very effective and since I have been using one belonging to the school all day. I now have my own to take home. I’m looking forward to the rest of the week. After searching for my stud finder for a couple of days “literally” I located where I want to hang my saw till and found some scrap poplar to make the cleats. It’s roughly 1″ x 6″ x 24″ but I’m not measuring. I grabbed a straight edge and pencil and marked off the position of the saw cut. the angle across the end is 45 degrees. Next I used my marking knife to define the lines. 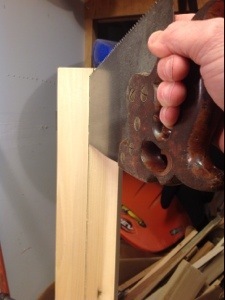 looking around the garage I thought that the best way to make this cut may be using my table saw with the blade angled. Realizing that it still has a dado blade installed, pushed up against the wall and has a whole pile of “crafty stuff” piled around it, perhaps I could do this with a hand saw. The term “crafty stuff” refers to the many projects that my wife gets involved in that is above my comprehension. There are some rules about “crafty stuff” the most important being…If I move it-it will break, if it breaks it will be my fault…..etc. Suffice to say sometimes it is best to leave crafty stuff alone. I have not used power tools on this project to this point and why start now! Clamping the wood into my vice I grab my dovetail saw to make an initial cut. My thought is that if I begin with this saw I can get a good start and switch to my handsaw which doesn’t have the back. I progress down the cut switching to my hand saw when the back is touching the wood. My handsaw is a Disston D8 that I picked up on Ebay about a year ago. It is filed rip at 5 1/2 TPI. I really like this saw and looked for a few months before finding it. The handle fits my hand very well. 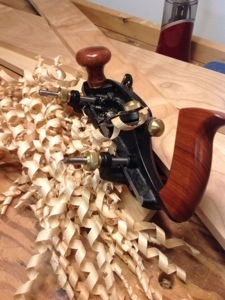 I sent it to Bob Rozaieski at Logan Cabinet Shoppe to have it sharpened and was amazed at how quickly it saws. 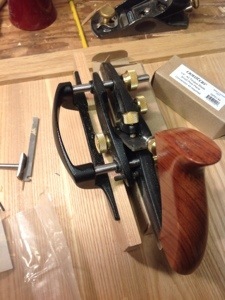 Additionally Bob answered many questions and since, I have had him sharpen other saws. 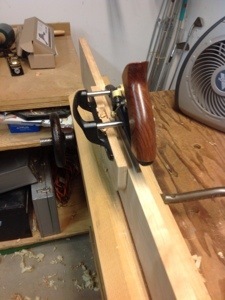 I progressed down the board moving it up in the vice a few times until I reached the last couple of inches. At this point instead of turning the board over and starting from the opposite end, I flipped the saw over and completed the cut. Seemed logical to me and worked, although I haven’t seen anyone else do this. The cut generally followed the line and I only had a few passes with a plane to clean it up. This was quicker than using the table saw! I think it has taken longer to write about it and correct all of the mis-spellings. Next I grabbed a few screws and attached one side to the wall and the other to the saw till. When the weather stays above fifty I will add a couple of coats of shellac. The other piece I added was a small divider to keep my saws separated, which is in the back of the till. 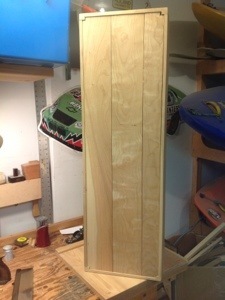 I just glued it to the two outermost boards of the back to allow for movement. Finally I have all of my tools off the bench and safely stored away and if you notice a couple of empty slots for some different saws! The sun is out and the thermometer is hovering near 50 degrees. Opening the garage door the light has flooded into my corner of the garage and I can hear the birds chirping outside. I feel like a prairie dog cautiously lifting its head above the burrow and looking around. 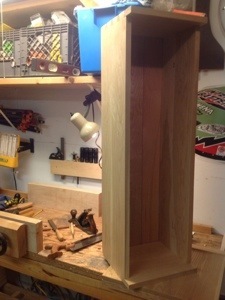 Woodworking in natural light is a great improvement and I’m looking forward to a long list of spring projects. Today before I begin something new, I plan on tackling one of those projects that has lingered long enough. The tool chest is complete and I have cleared my bench of tools, but there remains 5 saws that have cluttered up the top of my cabinets for months. Dusting off the carcass of my saw till I struggle to recall what I have to do to finish it up and make room for new projects. Glueing together two boards I prepare to make a shelf to divide the saws from a future drawer. Then after planing it square and to the correct thickness, I cut dados across the till sides. 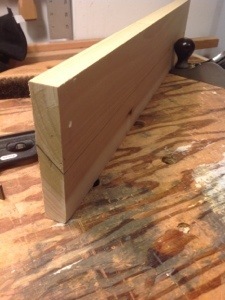 First I mark the bottom of each dado with my square and marking knife. 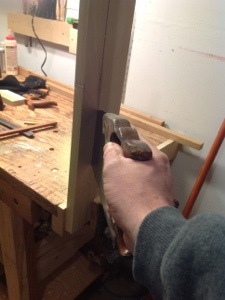 Using a chisel; a knife wall is created and I cut the side of the mortise with a saw using the wall as a guide. 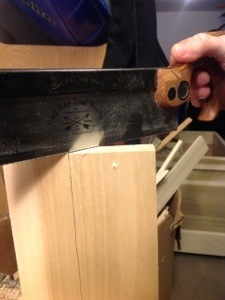 Placing the shelf in the slot, the marking knife is used to mark the other side and a second knife wall cut. 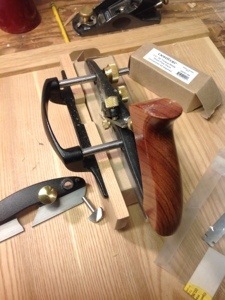 Eventually I use my router plane to complete the slot. This is repeated on the opposite side. Final fitting of the shelf is done with my plane. 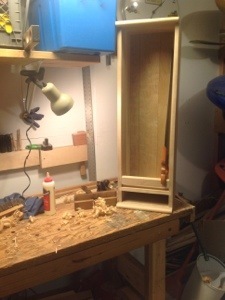 After test fitting the cross piece and mortises I glued up the case using hide glue. All went together well and I now have most of the components for the saw till. Remaining on the project is to install the back, make french cleats to hang the till onto the wall and come up with some means to separate the saw blades on the back of the till. Another day and I should be done. I am very excited to get my saws off of the bench and move onto other projects. Now if I can just figure out where the wall studs are…………..
Several weeks ago I began the process of building a home for my handsaws. 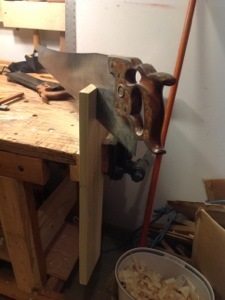 Admittedly I don’t have a handsaw problem…yet, however I do have a tool problem. I need a home to store them safely and this is why I have been building the tool chest and along the way a saw till. 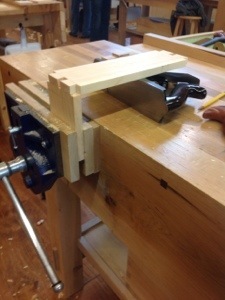 Following along with Shannon Rogers and the Hand Tool School I have built the saw till carcass and have reached a point where I need to prepare and install the back. I prepared three boards approximately 1/2″ thick and then planned to cut a rabbit in the back of the carcass to support the boards. Cutting the Rabbit along the inside of the carcass did not turn out as simple as it first appeared. Working without a plan sometimes gives you unexpected opportunities. In the case of the saw till the first chance to try a new skill came when I realized that I had not positioned the dovetails to hide the rabbit. I now had the job of cutting stopped rabbits that would not be exposed on the sides of the carcass. I used my skew rabbit plane to cut the majority of the groove then using a chisel to finish them up leaving some material in the corner. Took a little more time than it should have, due to the chisel work but I am pleased with the result. The back will consist of three boards and I have a choice of ship lapped joints or tongue and groove for their installation into the rabbit. After my great experience with tongue and groove on the tool chest bottom boards I decided to try it again on this project. I installed the 1/4″ cutter on my plow plane and proceeded to plow a groove on one side of the two outer boards. The other edge of these boards will rest against the carcass. I then notched the corner of these boards to fit the notches in the carcass. As I mentioned in a previous post making the tongue for the joint using the veritas plow plane requires the installation of the conversion kit and blade. This is a simple process and only takes a couple of minutes to complete. 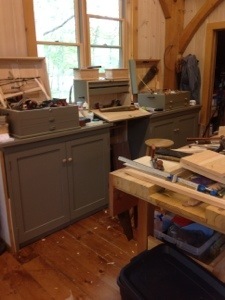 One caution…clear an area of the bench so you can spot the screws and washer. I managed to drop the washer in a pile of shavings and for a couple of tense moments thought I had lost it. The pictures below show the additional skate which is part of the conversion kit. It is installed onto the plane and the blade fitted between this skate and the main skate. After 10 minutes I have placed a tongue on both sides of the middle board and installed all three into the back of the till. A few more parts and I can get my saws safely off my bench and out of the way.